You are currently browsing the category archive for the ‘Gear and Equipment’ category. Motorcycle accessories are expensive. In fact, I remember reading once that when you buy a motorcycle, you’re really just making a down payment on accessories. My experience bears this out. Yesterday I was riding solo and stopped by Van Sant Airport in Bucks County, PA – a regular gathering place for bikers. 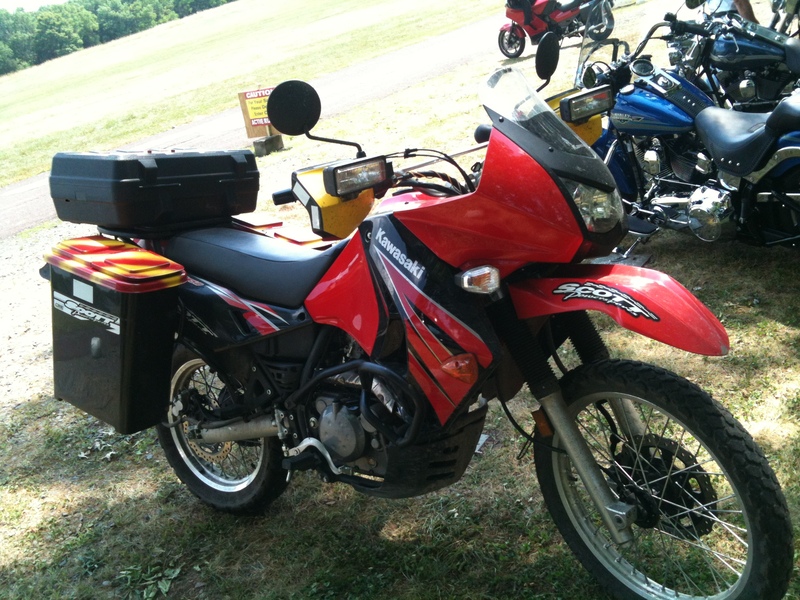 As I was munching on a hotdog from the snack bar, I noticed a Kawasaki KLR-650 pull in. 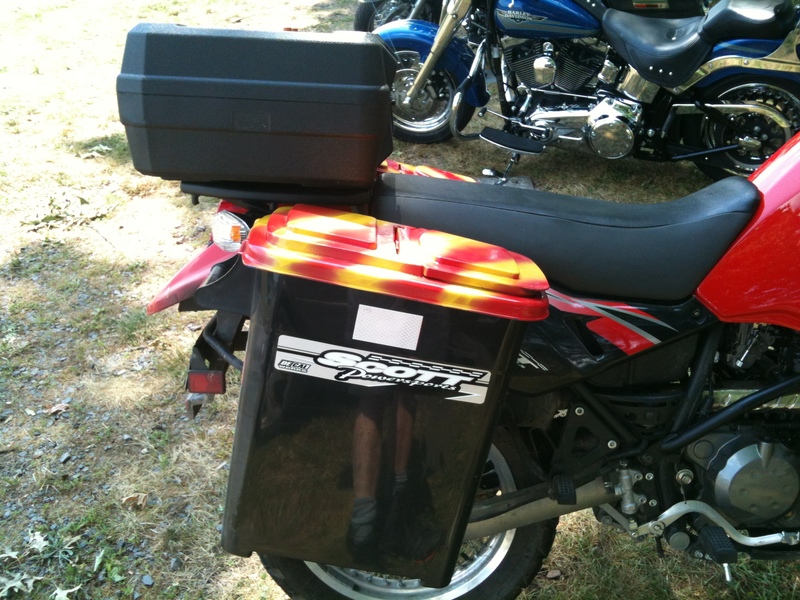 The KLR is a similar bike to my V-Strom, so my interest was already piqued, and this particular bike had what looked like a very unusual set of panniers and topbox. Close-up of the pannier. The sticker is from a local motorcycle shop, not the manufacturer. Close up of the top box. 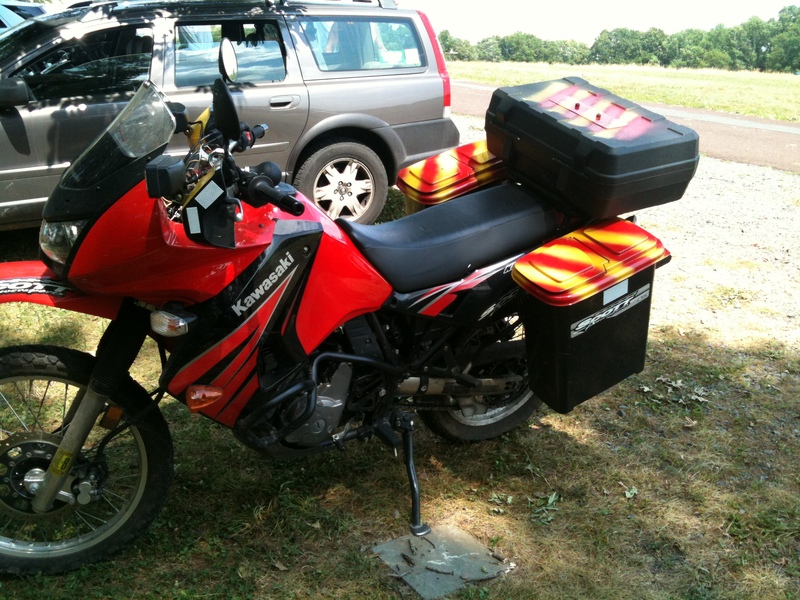 I’ll admit it’s not as flashy as a set of Touratech luggage but, damn! I’m impressed with Pete’s resourcefulness. 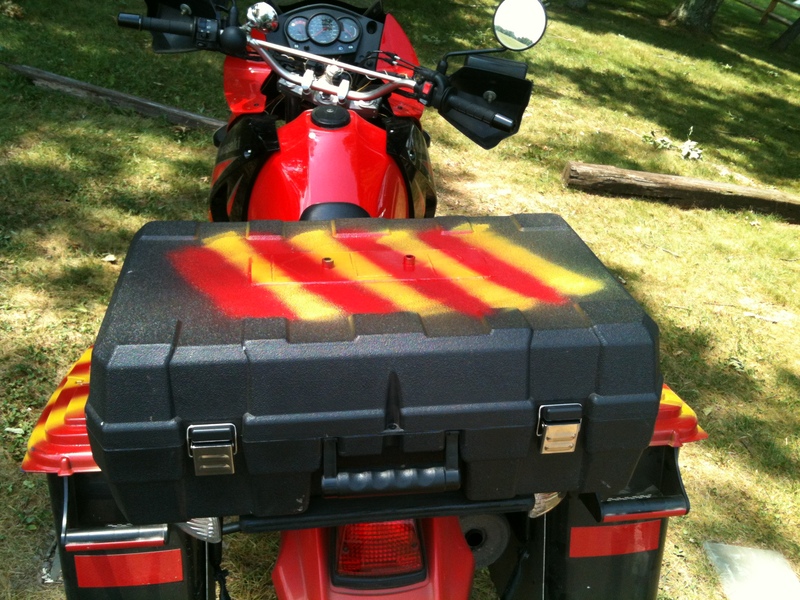 As they say in baseball about an ugly hit, “Not purdy but effective.” The same holds true for Pete’s home made motorcycle luggage. Battery life is limited. I’m only getting about an hour of life from the battery. Navigating the settings is a challenge. If I ever lose the users manual to this camera, I’m screwed. The settings are in a decision tree embedded within the camera and proffered up on a miniscule display in arcane codes. Every time I want to change settings I have to bust out the manual, which means I have to carry it with me on every ride. It’s hard to turn it off and on while riding. You have to firmly press the power button and hold it down for 7 seconds for the unit to power up. And there is no way from the rider’s seat to know if it has powered up successfully or not. If your finger wavers on the power button even for a moment it won’t turn on. There have been times I thought I was recording awesome footage, but I wasn’t. It’s hard to engage the shutter button while riding. Pressing the shutter button requires a firm press to engage, and there’s no way for the rider to know if the camera is actually recording. The red blinking LED that’s on the front, confirming operation, should be mounted on the back. Likewise, because of the tricky shutter button, there have been times I thought I was recording awesome footage, but I wasn’t. I think the latter two complaints are because the GoPro is intended as a “set it and forget it” video recording device. The editing is supposed to be done when you’re done your ride and back at home. But I’m pretty limited when it comes to video editing, and prefer to record brief memorable segments of my ride, upload ’em and ditch the whole editing process. I’m going to keep experimenting with the GoPro and hopefully I’ll become a true believer like just about everyone else who has tested and reviewed this camera, but for now the jury is still out.